A modern take on an iconic southwest symbol. Iron PonyShoe with a fresh industrial powder coat finish. INSPIRED BY CAST + CREW'S ORIGINAL HOME, MARFA, TX: A town that is occupied by artists and craftsman of all types. It’s a place where modern aesthetic and practice meets the traditions of the old wild west in a melting pot of creativity and invention. By powder coating our Lucky Ponyshoes, we change the symbol’s texture to produce a beautiful object that anyone can hang above their door or use in their shrine to accent their lives with a little more luck than they had before. Our PonyShoe is our more minimal/modern take on this southwest classic. It is smaller in size making it a unique alternative to the common regular size horseshoe. 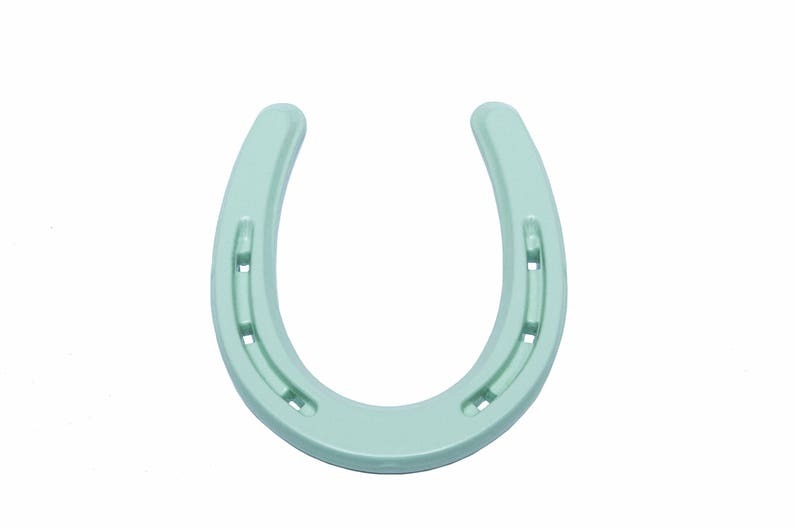 ++And Don't Forget to Hang Your PonyShoe Right Side Up (as shown) in Order to Keep All of Your Good Luck In. Cute but not as exciting and smaller than expected still i like the idea of Pony shoe in colors.